• Thiazolidinediones, including ACTOS, cause or exacerbate congestive heart failure in some patients [see Warnings and Precautions (5.1)]. • After initiation of ACTOS, and after dose increases, monitor patients carefully for signs and symptoms of heart failure (e.g., excessive, rapid weight gain, dyspnea, and/or edema). If heart failure develops, it should be managed according to current standards of care and discontinuation or dose reduction of ACTOS must be considered. • ACTOS is not recommended in patients with symptomatic heart failure. • Initiation of ACTOS in patients with established New York Heart Association (NYHA) Class III or IV heart failure is contraindicated [see Contraindications (4) and Warnings and Precautions (5.1)]. After initiation of ACTOS or with dose increase, monitor patients carefully for adverse reactions related to fluid retention such as weight gain, edema, and signs and symptoms of congestive heart failure [see Boxed Warning and Warnings and Precautions (5.5)]. • Initiation in patients with established NYHA Class III or IV heart failure [see Boxed Warning]. • Use in patients with known hypersensitivity to pioglitazone or any other component of ACTOS. Patients receiving ACTOS in combination with insulin or other antidiabetic medications (particularly insulin secretagogues such as sulfonylureas) may be at risk for hypoglycemia. A reduction in the dose of the concomitant antidiabetic medication may be necessary to reduce the risk of hypoglycemia [see Dosage and Administration (2.2)]. Tumors were observed in the urinary bladder of male rats in the two-year carcinogenicity study [see Nonclinical Toxicology (13.1)]. In addition, during the three year PROactive clinical trial, 14 patients out of 2605 (0.54%) randomized to ACTOS and 5 out of 2633 (0.19%) randomized to placebo were diagnosed with bladder cancer. After excluding patients in whom exposure to study drug was less than one year at the time of diagnosis of bladder cancer, there were 6 (0.23%) cases on ACTOS and two (0.08%) cases on placebo. After completion of the trial, a large subset of patients was observed for up to 10 additional years, with little additional exposure to ACTOS. During the 13 years of both PROactive and observational follow-up, the occurrence of bladder cancer did not differ between patients randomized to ACTOS or placebo (HR =1.00; [95% CI: 0.59âˆ’1.72]). A large prospective10-year observational cohort study conducted in the United States found no statistically significant increase in the risk of bladder cancer in diabetic patients ever exposed to ACTOS, compared to those never exposed to ACTOS (HR =1.06 [95% CI 0.89âˆ’1.26]). A retrospective cohort study conducted with data from the United Kingdom found a statistically significant association between ever exposure to ACTOS and bladder cancer (HR: 1.63; [95% CI: 1.22âˆ’2.19]). ACTOS should be used with caution in patients with edema. Because thiazolidinediones, including ACTOS, can cause fluid retention, which can exacerbate or lead to congestive heart failure, ACTOS should be used with caution in patients at risk for congestive heart failure. Patients treated with ACTOS should be monitored for signs and symptoms of congestive heart failure [see Boxed Warning, Warnings and Precautions (5.1) and Patient Counseling Information (17)]. In six pooled 16- to 26-week placebo-controlled monotherapy and 16- to 24-week add-on combination therapy trials, the incidence of withdrawals due to adverse events was 4.5% for patients treated with ACTOS and 5.8% for comparator-treated patients. The most common adverse events leading to withdrawal were related to inadequate glycemic control, although the incidence of these events was lower (1.5%) with ACTOS than with placebo (3.0%). A summary of the incidence and type of common adverse events reported in three pooled 16- to 26-week placebo-controlled monotherapy trials of ACTOS is provided in Table 1. Terms that are reported represent those that occurred at an incidence of >5% and more commonly in patients treated with ACTOS than in patients who received placebo. None of these adverse events were related to ACTOS dose. A summary of the incidence of adverse events related to congestive heart failure is provided in Table 6 for the 16- to 24-week add-on to sulfonylurea trials, for the 16- to 24-week add-on to insulin trials, and for the 16- to 24-week add-on to metformin trials. None of the events were fatal. In the PROactive trial, 5238 patients with type 2 diabetes and a history of macrovascular disease were randomized to ACTOS (N=2605), force-titrated up to 45 mg daily or placebo (N=2633) in addition to standard of care. Almost all patients (95%) were receiving cardiovascular medications (beta blockers, ACE inhibitors, angiotensin II receptor blockers, calcium channel blockers, nitrates, diuretics, aspirin, statins and fibrates). At baseline, patients had a mean age of 62 years, mean duration of diabetes of 9.5 years, and mean HbA1c of 8.1%. Mean duration of follow-up was 34.5 months. The primary objective of this trial was to examine the effect of ACTOS on mortality and macrovascular morbidity in patients with type 2 diabetes mellitus who were at high risk for macrovascular events. The primary efficacy variable was the time to the first occurrence of any event in a cardiovascular composite endpoint that included all-cause mortality, nonfatal myocardial infarction (MI) including silent MI, stroke, acute coronary syndrome, cardiac intervention including coronary artery bypass grafting or percutaneous intervention, major leg amputation above the ankle, and bypass surgery or revascularization in the leg. A total of 514 (19.7%) patients treated with ACTOS and 572 (21.7%) placebo-treated patients experienced at least one event from the primary composite endpoint (hazard ratio 0.90; 95% Confidence Interval: 0.80, 1.02; p=0.10). Tables 10 and 11 summarize the changes in body weight with ACTOS and placebo in the 16- to 26-week randomized, double-blind monotherapy and 16- to 24-week combination add-on therapy trials and in the PROactive trial. Tumors were observed in the urinary bladder of male rats in the two-year carcinogenicity study [see Nonclinical Toxicology (13.1)]. During the three year PROactive clinical trial, 14 patients out of 2605 (0.54%) randomized to ACTOS and 5 out of 2633 (0.19%) randomized to placebo were diagnosed with bladder cancer. After excluding patients in whom exposure to study drug was less than one year at the time of diagnosis of bladder cancer, there were 6 (0.23%) cases on ACTOS and two (0.08%) cases on placebo. After completion of the trial, a large subset of patients was observed for up to 10 additional years, with little additional exposure to ACTOS. During the 13 years of both PROactive and observational follow-up, the occurrence of bladder cancer did not differ between patients randomized to ACTOS or placebo (HR =1.00; 95% CI: 0.59-1.72) [see Warnings and Precautions (5.4)]. • New onset or worsening diabetic macular edema with decreased visual acuity [see Warnings and Precautions (5.7) ]. • Fatal and nonfatal hepatic failure [see Warnings and Precautions (5.3)]. An inhibitor of CYP2C8 (e.g., gemfibrozil) significantly increases the exposure (area under the serum concentration-time curve or AUC) and half-life (t1/2) of pioglitazone. 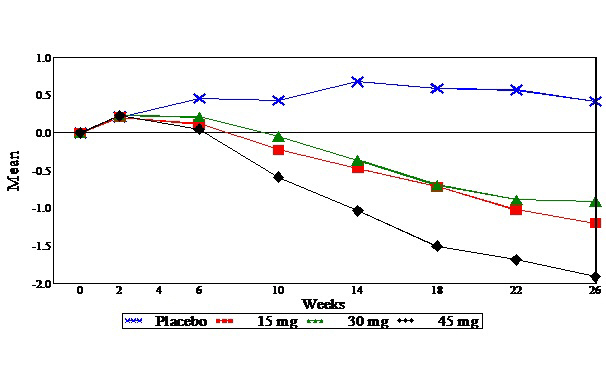 Therefore, the maximum recommended dose of ACTOS is 15 mg daily if used in combination with gemfibrozil or other strong CYP2C8 inhibitors [see Dosage and Administration (2.3) and Clinical Pharmacology (12.3)]. A decrease in the exposure of pioglitazone and its active metabolites were noted with concomitant administration of pioglitazone and topiramate [see Clinical Pharmacology (12.3)]. The clinical relevance of this decrease is unknown; however, when ACTOS and topiramate are used concomitantly, monitor patients for adequate glycemic control. In animal reproduction studies, no adverse developmental effects were observed when pioglitazone was administered to pregnant rats and rabbits during organogenesis at exposures up to 5- and 35-times the 45 mg clinical dose, respectively, based on body surface area [see Data]. Pioglitazone administered to pregnant rats during organogenesis did not cause adverse developmental effects at a dose of 20 mg/kg (~5-times the 45 mg clinical dose), but delayed parturition and reduced embryofetal viability at 40 and 80 mg/kg, or â‰¥9-times the 45 mg clinical dose, by body surface area. In pregnant rabbits administered pioglitazone during organogenesis, no adverse developmental effects were observed at 80 mg/kg (~35-times the 45 mg clinical dose), but reduced embryofetal viability at 160 mg/kg, or ~69-times the 45 mg clinical dose, by body surface area. When pregnant rats received pioglitazone during late gestation and lactation, delayed postnatal development, attributed to decreased body weight, occurred in offspring at maternal doses of 10 mg/kg and above or â‰¥2 times the 45 mg clinical dose, by body surface area. There is no information regarding the presence of pioglitazone in human milk, the effects on the breastfed infant, or the effects on milk production. Pioglitazone is present in rat milk; however due to species-specific differences in lactation physiology, animal data may not reliably predict drug levels in human milk. The developmental and health benefits of breastfeeding should be considered along with the mother's clinical need for ACTOS and any potential adverse effects on the breastfed infant from ACTOS or from the underlying maternal condition. ACTOS is not recommended for use in pediatric patients based on adverse effects observed in adults, including fluid retention and congestive heart failure, fractures, and urinary bladder tumors [see Warnings and Precautions (5.1, 5.4, 5.5 and 5.6)]. A total of 92 patients (15.2%) treated with ACTOS in the three pooled 16- to 26-week double-blind, placebo-controlled, monotherapy trials were â‰¥65 years old and two patients (0.3%) were â‰¥75 years old. In the two pooled 16- to 24-week add-on to sulfonylurea trials, 201 patients (18.7%) treated with ACTOS were â‰¥65 years old and 19 (1.8%) were â‰¥75 years old. In the two pooled 16- to 24-week add-on to metformin trials, 155 patients (15.5%) treated with ACTOS were â‰¥65 years old and 19 (1.9%) were â‰¥75 years old. In the two pooled 16- to 24-week add-on to insulin trials, 272 patients (25.4%) treated with ACTOS were â‰¥65 years old and 22 (2.1%) were â‰¥75 years old. Although clinical experiences have not identified differences in effectiveness and safety between the elderly (â‰¥65 years) and younger patients, these conclusions are limited by small sample sizes for patients â‰¥75 years old. Patients with lipid abnormalities were included in clinical trials with ACTOS. Overall, patients treated with ACTOS had mean decreases in serum triglycerides, mean increases in HDL cholesterol, and no consistent mean changes in LDL and total cholesterol. There is no conclusive evidence of macrovascular benefit with ACTOS [see Warnings and Precautions (5.8) and Adverse Reactions (6.1)]. In vitro data demonstrate that multiple CYP isoforms are involved in the metabolism of pioglitazone, which include CYP2C8 and, to a lesser degree, CYP3A4 with additional contributions from a variety of other isoforms including the mainly extrahepatic CYP1A1. In vivo study of pioglitazone in combination with gemfibrozil, a strong CYP2C8 inhibitor, showed that pioglitazone is a CYP2C8 substrate [see Dosage and Administration (2.3) and Drug Interactions (7)]. Urinary 6ß-hydroxycortisol/cortisol ratios measured in patients treated with ACTOS showed that pioglitazone is not a strong CYP3A4 enzyme inducer. There are postmarketing reports of liver failure with ACTOS and clinical trials have generally excluded patients with serum ALT >2.5 times the upper limit of the reference range. Use caution in patients with liver disease [see Warnings and Precautions (5.3)]. Safety and efficacy of pioglitazone in pediatric patients have not been established. ACTOS is not recommended for use in pediatric patients [see Use in Specific Populations (8.4)]. Three 16-week, randomized, double-blind, placebo-controlled clinical trials were conducted to evaluate the effects of ACTOS (15 mg and/or 30 mg) on glycemic control in patients with type 2 diabetes who were inadequately controlled (HbA1c â‰¥8%) despite current therapy with a sulfonylurea, metformin, or insulin. In addition, three 24-week randomized, double-blind clinical trials were conducted to evaluate the effects of ACTOS 30 mg vs. ACTOS 45 mg on glycemic control in patients with type 2 diabetes who were inadequately controlled (HbA1c â‰¥8%) despite current therapy with a sulfonylurea, metformin, or insulin. Previous diabetes treatment may have been monotherapy or combination therapy. • It is important to instruct patients to adhere to dietary instructions and to have blood glucose and glycosylated hemoglobin tested regularly. During periods of stress such as fever, trauma, infection, or surgery, medication requirements may change and patients should be reminded to seek medical advice promptly. • Patients who experience an unusually rapid increase in weight or edema or who develop shortness of breath or other symptoms of heart failure while on ACTOS should immediately report these symptoms to a physician. • Tell patients to promptly stop taking ACTOS and seek immediate medical advice if there is unexplained nausea, vomiting, abdominal pain, fatigue, anorexia, or dark urine as these symptoms may be due to hepatotoxicity. • Tell patients to promptly report any sign of macroscopic hematuria or other symptoms such as dysuria or urinary urgency that develop or increase during treatment as these may be due to bladder cancer. • Tell patients to take ACTOS once daily. ACTOS can be taken with or without meals. If a dose is missed on one day, the dose should not be doubled the following day. • When using combination therapy with insulin or other antidiabetic medications, the risks of hypoglycemia, its symptoms and treatment, and conditions that predispose to its development should be explained to patients and their family members. • Inform female patients that treatment with ACTOS, like other thiazolidinediones, may result in an unintended pregnancy in some premenopausal anovulatory females due to its effect on ovulation [see Use in Specific Populations (8.3)]. ©1999 - 2017 Takeda Pharmaceuticals America, Inc. It is not known if ACTOS is safe and effective in children under the age of 18. ACTOS is not recommended for use in children. • See "What is the most important information I should know about ACTOS?" • broken bones (fractures). Usually in the hand, upper arm, or foot in women. Talk to your doctor for advice on how to keep your bones healthy. © 2009 - 2017 Takeda Pharmaceuticals America, Inc.